This easy chocolate cupcake recipe comes from a family Texas sheet cake recipe. OO M M GGGGG !! O O MM MM G !! O O M M M G GGG !! OO M M GGGGG ! These Texas sheet cake cupcakes are DELICIOUS and easy to make. They're so moist that "cake" doesn't even come to mind as a description, and they are chocolate-y without being overwhelming. The closest chocolate cake I could compare these to? Well, maybe imagine what it might be like if a red velvet cake and a chocolate cake had a super-moisturized kid. Delicious, obviously. I promise these Texas cupcakes are good. And, if you don't like cupcakes but you do believe in second chances, then try these. It is a family recipe, after all. From now on, ditch the "Extra-Moist" boxed cake mix...this is the real deal. You can see what I mean in the two photos below: moisture is practically pouring out of your computer. The secret? My hunch is that the cup of sour cream in the recipe has something to do with it. 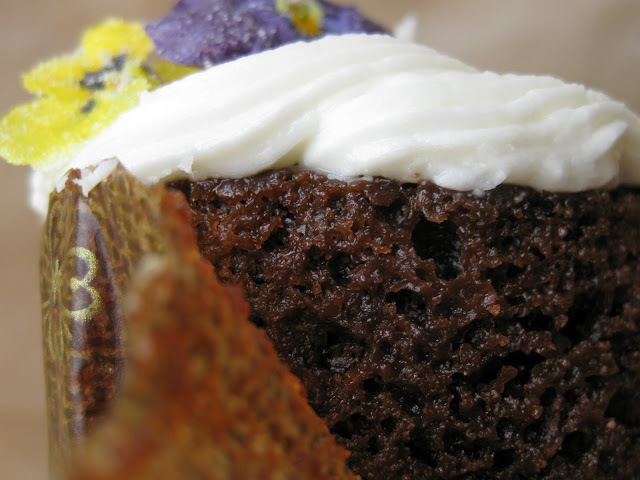 Texas chocolate sheet cake cupcakes so moist, a goldfish could live in them. After hearing about this family recipe for amazing Texas chocolate sheet cake cupcakes multiple times on separate occasions and being told about the miracles they were working (Being supremely moist? Converting cupcake-haters into cupcake-lovers? ), I decided it was time to try them. I did, and I have to say, we're all pretty lucky that J.R.'s mom agreed to share this recipe with us. J.R. told me that this is the standard recipe for birthday cakes in her family. Aging has never sounded so delicious. Plus: "The recipe is kind of fail-proof (a.k.a. my dad can make it)." Bonus! Chocolate cupcakes so moist, you could water plants with them. Texas sheet cake is often topped with a fudgey, chocolate frosting, but not this time. 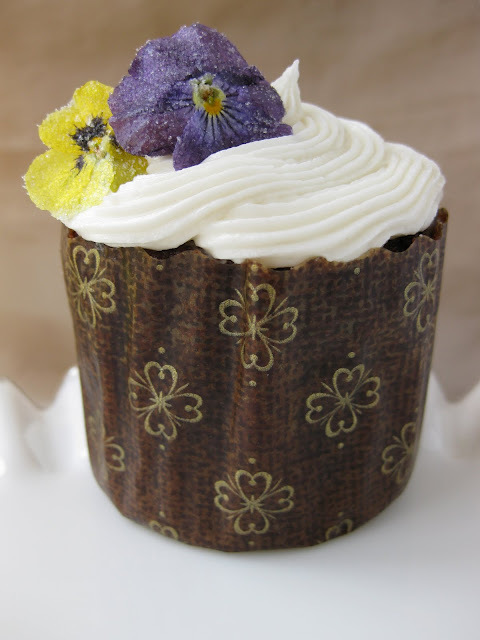 To pay homage to the family that shared the recipe, I frosted the cake true to their family tradition with the vanilla buttercream frosting recipe they use and an edible flower (sugared flowers, in fact!) for decoration. Check below for the texas sheet cake recipe and frosting recipe, and take a look at my post on how to make candied flowers if you'd like to try that, too. 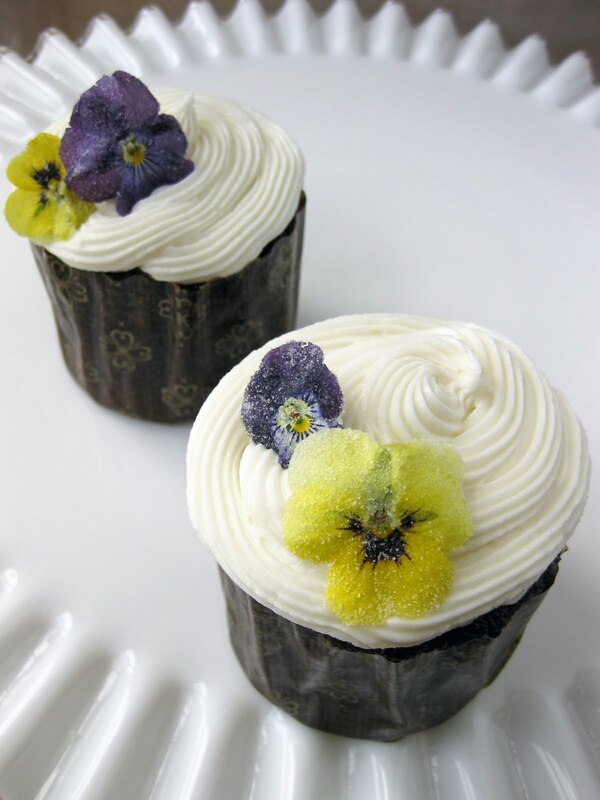 They do make for some fancy cupcakes once you add the candied flowers. These fancy cupcakes are from JR's family Texas chocolate sheet cake recipe. 2. Bring to a boil: butter, water, cocoa. Let cool briefly. 3. In a bowl, mix: flour, sugar, salt, baking soda. 4. Pour boiled cocoa mixture over flour mixture. Blend well. 5. Mix eggs and sour cream together in bowl just until smooth (makes them easier to blend into the other ingredients). Stir into remaining mixture just until combined. Be gentle with the eggs...if you over-beat them, you may end up with a dry cake. 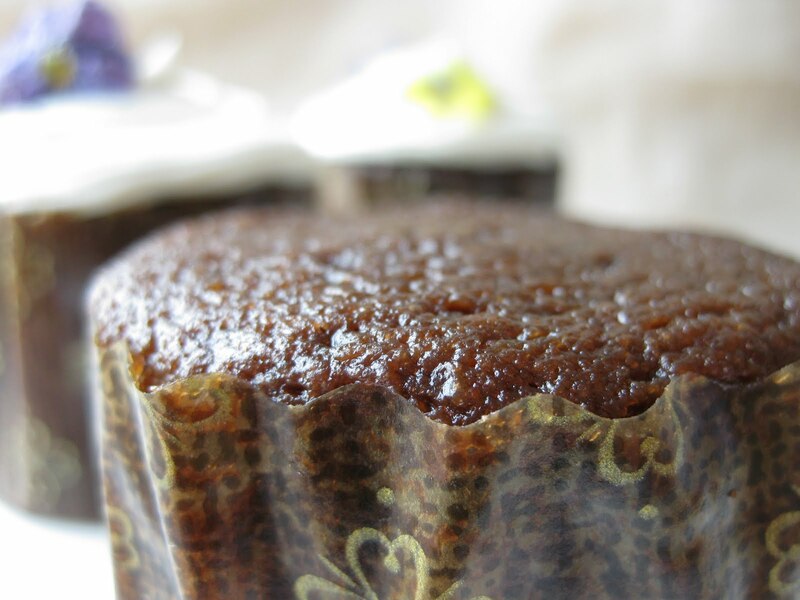 Bake the cake in an ungreased pan for 20-22 minutes (less for cupcakes). Let cool completely before frosting them. The cake freezes well, too, if you'd like to stash some away for later (It's SUPER exciting to discover some in the freezer when you thought it was all gone...based on recent personal experience). Combine in a large bowl with mixer at low speed. Add more milk if necessary. Use immediately, or refrigerate. Will keep for up to 2 weeks in refrigerator. Let refrigerated frosting come to room temperature, then whip briefly before using. Fancy cupcakes thanks to those fancy wrappers. Exciting! Volcanic! Good lookin'! 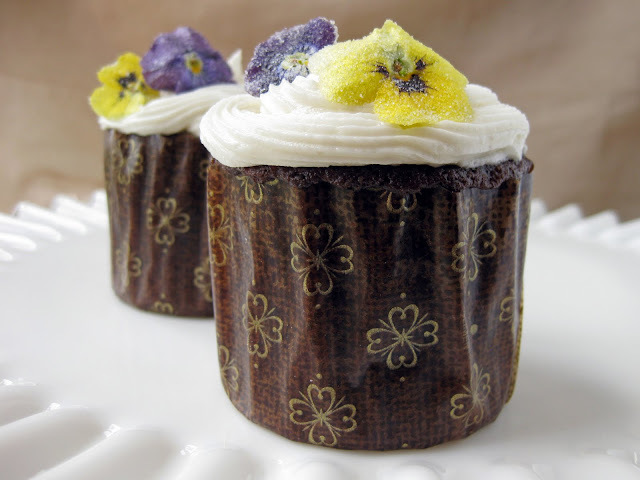 I thought it would be fun to try some free-standing fancy cupcake wrappers. You can see them in the photos above. Annnnd...What did I learn? Are you still using a point and shoot? The bokeh in these pics is gorgeous! Some of the most interesting food blogging I've seen so far! A favorite variation of mine - especially with chocolate frosting - is to use cold coffee to replace the water.